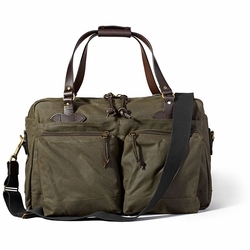 Filson 48-Hour Duffle. An overnight bag with a reinforced base and multiple carrying options. Rain-repellent Tin Cloth and durable Bridle Leather combine in this bag built for overnight and weekend trips. The rustproof brass zipper opening allows full bag access, and the interior is fully lined to protect gear. The base is reinforced to help it maintain shape while you're packing, and to further protect from mud and rain. A removable, adjustable cotton webbing shoulder strap and Bridle Leather handles long enough to sling over your shoulder give plenty of carrying options.